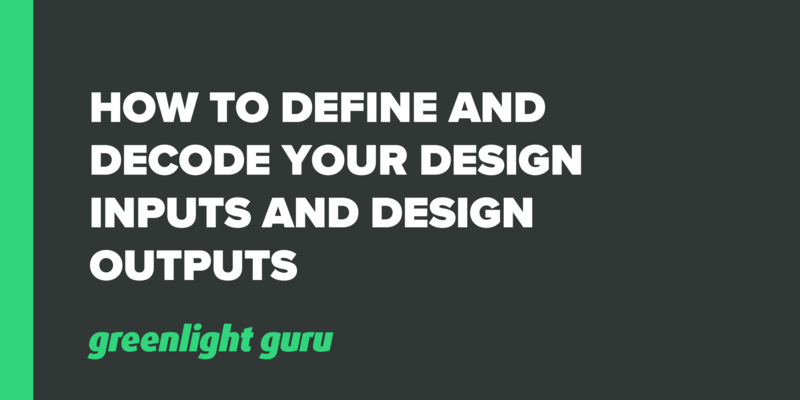 How well have you defined your design inputs and design outputs? I see some common mistakes happening there so it’s time to “decode” the two and take a look at what you can do to make your job easier down the line, especially when you’re putting together your device master record. Free Bonus Giveaway: Need help defining your user needs? Grab our free tips here. Let’s look at a basic example: Say your input is “the length of the device should be between 5 and 10 centimeters.” The mistake is to just rehash this statement when documenting the design output, for example “the device is between 5 and 10 centimeters in length.” This is incorrect as the output really should be something that actually describes the device itself in more detail, such as a drawing or specification. "Design input is the starting point for product design. The requirements which form the design input establish a basis for performing subsequent design tasks and validating the design. Therefore, development of a solid foundation of requirements is the single most important design control activity." Well-crafted requirements are stated in a way that are measurable and provides clear objective criteria. You will use this later to demonstrate that these requirements have been met. Your design outputs are a preliminary round for your DMR. Design outputs are captured and documented initially during the design and development process as you’re figuring out parts, pieces, materials, and how you’ll manufacture the product. The way we close the loop on all of these from a design input / design output relationship is through design verification. This is a set of objective activities (tests, analysis, or inspections), which demonstrate your design outputs meet your design inputs. Still using a manual or paper-based approach to manage your design controls or quality processes? Click here to learn more about how Greenlight Guru's modern eQMS software platform exclusively for medical device companies is helping device makers all over the globe in more than 320 cities and 26 countries get safer products to market faster with less risk while ensuring regulatory compliance.